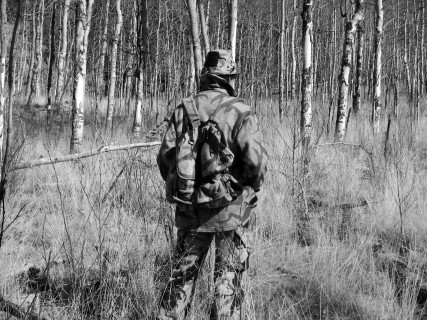 Camouflage… a French word that seemed to stick around the world. It has been applied in many ways during wars from soldiers to battleships. The first original Trebark pattern gained momentum with their new look hunters liked. It was new and different, but applied basic principal of outlined contrasting colored shapes in an identifiable image, bark. Since, camouflage has gone in many directions. A hunter’s bottom line is deception near game pursued. Most hunted big game animals are ungulates, (animals with clift feet), like types are; deer, elk, sheep, antelope, goats and so on. These animals have a black and white vision from what science has told us. This is due to the numbers of light receptive nerve ending cells of rods and cones, different in numbers from humans, in their eyes perceiving light in a black to white spectrum of grays. Objects appearing a lighter color of gray are further away. While objects in dark grays or black appear closer up. The makeup of their larger internal eyes has a greater ability to gather and reflect light into these cells for seeing in the dark too. Camouflage designs applying this principal can create artful depth-of-field images where dark images overlap the lighter colored ones in the design thus setting the three dimensional affect. The background is best when it is close to a white, for this is seen as infinity. When you are viewed like this it changes your solid form into one that an animal sees straight through as part of their surroundings. Some camouflage patterns are defined as having a graphic hard edge. This is accomplished by having contrasting colors positioned so they create a definitive line from the shapes and values. The entire image then attributes to the depth-of-field appearance of light and dark colors. Larger and darker images surrounded by lighter ones in the overall design, continues to be effective to breakup your outline as the distance increases. Repetition of hard edge images confuses their visual ability to depict your position. Realistic images of trees, branches and foliage printed in focus with sharp details and repeated in a more blurred appearance of additional branches etc. can accomplish this too with the use of lighter to darker colors. These are best suited for closer hunting applications.